Making my way through the farmers’ market in August puts me into stone-fruit sensory overload on (healthy) par with my annual pre-Halloween trip to Economy Candy. Of the peach variety, there are Saturn, yellow, white and donut peaches (also yellow and white). Nectarines are yellow and white as well. Plums are even more diverse: there’s Damson, Greengage, Mirabelle, Golden Sugar, Yellow Shiro, Italian prune plums, Metlley and Santa Rosa. 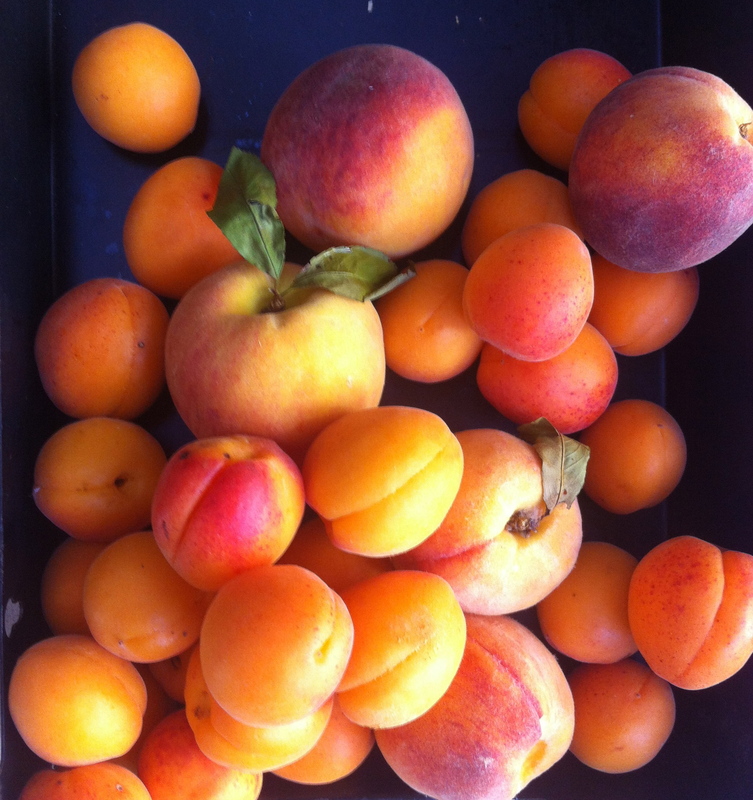 Then there are apricots, and apricot-plum hybrids: pluots, plumcots and apriums—each one more delicious than the next. Peaches and nectarines are easily my favorite for eating out of hand, but unfortunately, I must wait until I get home to peel them first or cook them. A fairly recent development, relatively speaking, I developed a sensitivity to stone fruit about 10 or so years ago which I noticed after eating a few handfuls of cherries. My lips, mouth and throat had become terribly itchy. Initially, I thought maybe it was a reaction to pesticides but the cherries were organic so that theory was out, especially since I had the same reaction the following week to a different batch. Sadly, peaches and nectarines were soon to follow. Oddly, plums are fine, but of course, they’re not my favorites. So, what’s an itchy-palette/stuffy-sinus-suffering stone-fruit fanatic to do if she’s too lazy to peel? 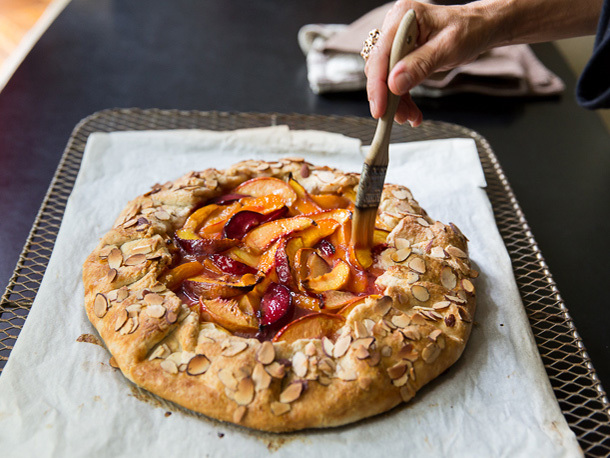 Bake them into a shatteringly crispy, jammy-fruit-juicy galette. 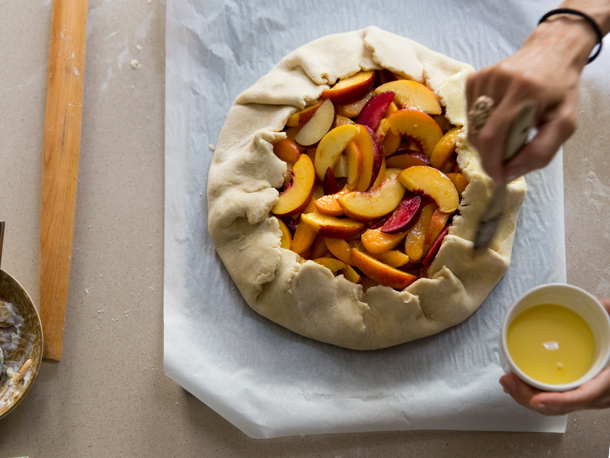 : Peaches, nectarines, plums and apricots, with just a bit of sugar and flour, unpeeled and piled high in a sturdy yet flaky all-butter pastry—it really doesn’t get better than that. Check out the interview on Serious Eats, shot by the lovely Alice Gao. Preheat the oven to 375° and set a rack in the lower third. Line a large cookie sheet with parchment paper. Place the pastry dough on a floured surface and using a rolling pin, gently pound to flatten it slightly. 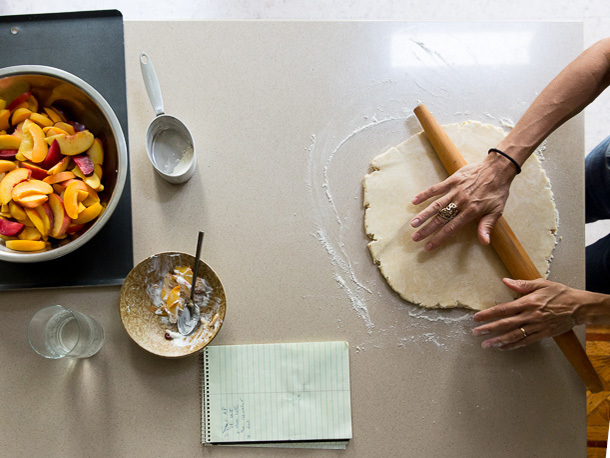 Roll the pastry to a 15-inch circle, about ¼-inch thick and slide it onto the parchment-lined cookie sheet, patching any tears. Refrigerate the pastry for 15 minutes. Meanwhile, make the filling: in a large bowl, combine the fruit with the sugar and salt. Sprinkle the 2 tablespoons flour in the center of the pastry. Mound the fruit and juices in the center of the pastry, leaving a 2-inch border. 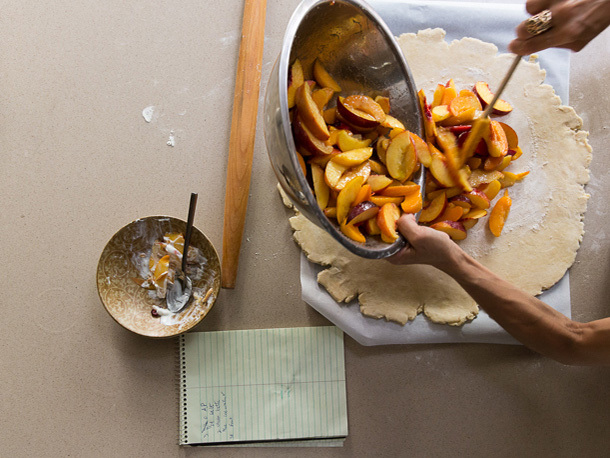 Fold up the sides, crimping the dough to partially encase the fruit. 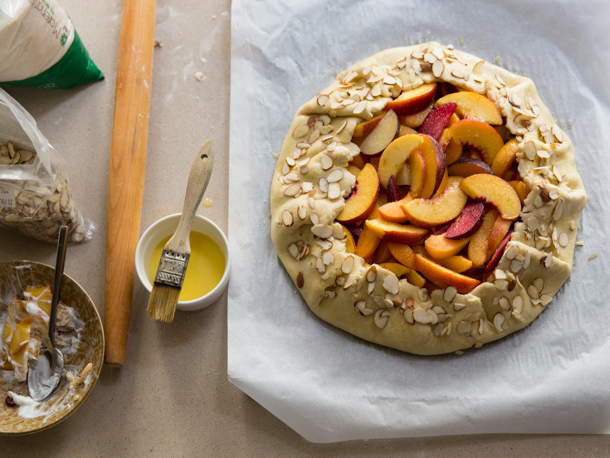 Garnish and bake the galette: Brush the border with the egg yolk mixture, sprinkle with the almonds and sugar and bake for about 70 minutes, or until the crust is golden and the fruit is tender and bubbling. Cover loosely with foil if the top darkens too quickly. Rinse out the pastry brush and brush the cooked fruit with some of the juices to moisten. Let cool on the baking sheet for 30 minutes, then cut into wedges and serve. In the bowl of a food processor, pulse the flour and salt. Add the cubed butter and pulse in 1 second bursts 5 times. The butter should be the size of small peas. Lift the lid, pour in the water and pulse 5 or 6 times, just until the dough is moistened, but doesn’t form a ball. Turn the crumbs onto a work surface, and gather into a ball. 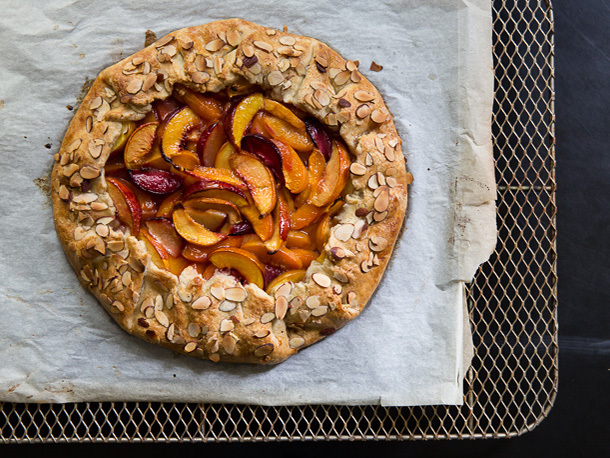 Your stone fruit galette looks marvellous! 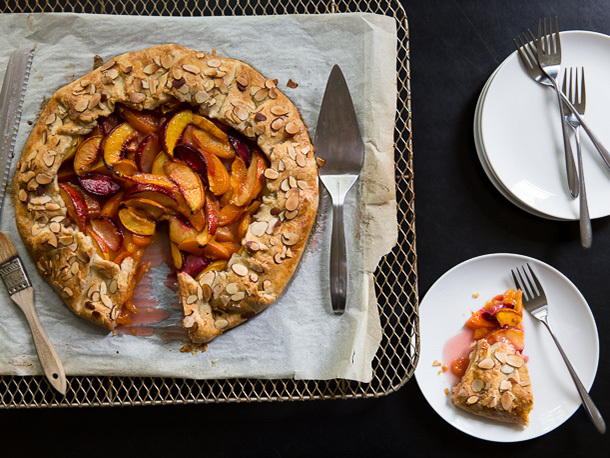 I love stone fruit too, especially when it’s cooked in the oven with golden pastry, it really makes a good treat for the summer. I’ll have to wait ’til January before I can make this though… Thanks for the lovely recipe. thank you, Sean. It’s really pretty easy as far as pastry goes. Too bad it’s winter where you are–I’m up to my eyeballs in peaches and plums! Good luck with your blog–i can’t wait to see how it progresses! This is a really simple and sure to be delicious dessert from cookbook author Grace Parisi, that I found on her food blog. After university, I really want to be a food writer like her, Jeffrey Steingarten, Nici Wickes. It sounds like a really cool career. Thanks, Judy. You could probably do either but I think it would be better to bake, cool & freeze. To serve, I’d thaw in the fridge almost completely & then refresh it UN-wrapped on a baking sheet at 325 for about 15 minutes. If it looks dark before its done, loosely tent it. I hope you like it! Let me know how it turns out.